The past couple of years have been tough for any company operating in the Gulf's construction sector - especially for those with exposure to Saudi Arabia. The value of contract awards in the kingdom fell dramatically in 2015 and 2016 as the government stopped signing any new deals and reviewed its spending commitments following a dramatic fall in oil prices in 2014. According to project and cost consultancy Faithful + Gould, the value of contracts awarded fell to $22 billion in 2016 and 2017, declining from $35.5 billion in 2015, $49.1 billion in 2014 and $69.1 billion in 2013. It is, therefore, a credit to United Arab Emirates-based RAK Ceramics that it has managed to keep its core revenue relatively stable at a time when the company has been undertaking a transformation of its operations as the Saudi market, which used to be its second-biggest market for tiles, witnessed such a fall-off in demand. In 2017, the company reported a 7.6 percent increase in core revenue to 2.6 billion UAE dirhams ($708 million), while total revenue increased by 2.2 percent to 2.85 billion dirhams. Its reported net income also jumped ten-fold to 315.5 million dirhams, but this included a one-off gain from the sale of non-core assets worth 61.7 million dirhams. RAK Ceramics was started by Ras Al Khaimah's ruler, Sheikh Saud bin Saqr Al Qasimi, in 1989 as a method for diversifying the emirate's economy. In December 2014, Sheikh Saud sold a 30.6 percent stake in the company to private equity firm Samena Capital, which came up with a three-year 'value creation plan' that involved exiting several businesses it deemed to be non-core, overhauling its production operations to grow capacity and changing its brand and routes to market. 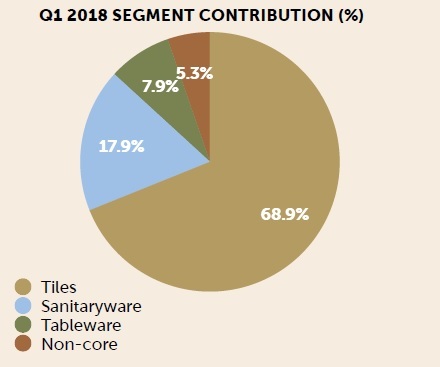 The company now focuses on tiles, sanitaryware and tableware and has production bases in three main markets - the UAE, India and Bangladesh. It also has a facility in Iran. In total, it employs more than 15,000 staff and it produces over 113 million square metres of tiles and 5 million pieces of sanitaryware. 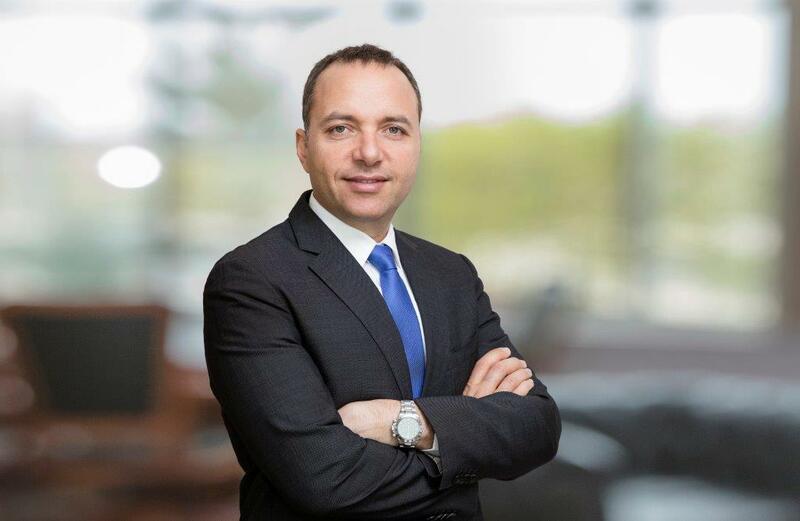 The company's CEO, Abdallah Massaad, said that the focus on its value creation plan had meant that it "took out a lot of non-core disruption and disturbance during a period where it (the core business) needed a focus". Speaking to Zawya in an interview which took place at the company's headquarters in mid-May, Massaad said: "The most important thing we have done is the rebranding and the repositioning of RAK Ceramics in the market - moving into our showrooms in the UAE, our way of presenting/offering the value of our product, the integration which we've done. Therefore, I cannot say that the market is great in the region - or even worldwide - during this period but with the changes, the focus we have done, we succeeded gaining market share in our core market." The company completed a significant rebranding in late 2016, and it has spent the past two years buying out distributors in Saudi Arabia and Europe so it can take more direct control of its routes to market. This has included creating a series of new showrooms (including the new, 8,000 square foot Dubai flagship that opened in May) as it looks to display its wares directly to architects, interior designers, developers and other specifiers as opposed to simply competing for tenders - often on a lowest-price basis. Massaad told analysts on an investors' call earlier this year that about 70 percent of new work is now being picked up through direct relationships, rather than through tenders or other direct sales. During the interview, Massaad said that the new showrooms allowed it to properly display products and “gave confidence to the big developers to use (us) even more and to rely more”. “We did not follow our peers by gaining or retaining market share by reducing our prices, it was gaining more market share by launching a differentiated product to maintain our quality and invest in R&D," he argued. Investment in product development has included new launches such as its Maximus mega-slabs of ceramic tiles up to three metres in height, which Massaad said can be used for outside cladding on towers as a useful method for fire protection, given heat absorption capacity of ceramics. Last year, the company completed two major deals in India, acquiring a 51 percent stake in a company based in Gujarat, Gris Ceramics, and a 51 percent stake in Gryphon Ceramics – a joint venture set up for a greenfield plant producing large-slab tiles, which is also in northern India. "India is a growing and valuable market for us where we feel we have a great opportunity," Massaad said. He argued that not only was domestic demand strong, but its investment in India also gives it the opportunity to vary export production between markets. The company currently exports to more than 150 countries around the world, yet it currently serves these mainly from its Ras Al Khaimah base. Anoop Fernandes, an analyst with Bahrain-based investment bank SICO, said that the pair of investments made last year gives the company a presence in Gujarat in the north of India, which is where most of the country's ceramics industry is based. Its existing Indian operation is in Andhar Pradesh in the South. "From an energy perspective, there is not that much difference in terms of cost, but they were saying that some of the raw materials are cheaper (in Gujarat). So for them to make vitirifed tiles that they can export - that is where they see an opportunity." More importantly, Fernandes said that the acquisitions should give the company complete control over product quality in India, where currently it sometimes relies on contract manufacturers to help meet demand. "Right now they have a certain capacity, but they sell a lot more," Fernandes told Zawya in a telephone interview. "It's almost more than twice their current capacity." The other major change RAK Ceramics has undertaken through its value creation plan has been its exit of a string of non-core businesses, which has included the company’s closure of a lossmaking business in Sudan and its withdrawal from China, plus the sale of a number of construction-related businesses in the UAE. Last year, for instance, it sold its majority (51 percent) share in mechanical, electrical and plumbing (MEP) contractor Electro RAK, its 50 percent stake in infrastructure contractor Emirates Heavy Engineering, and a 10 percent stake in building materials supplier Encom Trading. Notes to its 2017 accounts showed the sale of all three stakes for a combined consideration of 45 million dirhams meant a cumulative gain on disposal of 3.82 million dirhams over their book value. The company also sold a small percentage of shares in its Bangladesh business on the Dhaka stock exchange, raising 12.5 million dirhams. It still retains a stake of more than 68 percent in the venture, though. "Bangladesh is very important for us," Massaad said. "We are in the premium sector both in India and Bangladesh." He said that the company increased the capacity of its tile factory in Bangladesh last year, following an increase in sanitaryware capacity in 2016, but that demand in both markets meant this increased is being absorbed. One market which has seen less activity is Iran, due mainly to the current political standoff between the UAE and Iran impacting trade. The 2017 accounts also show the net assets of its Iranian business declined to 18.9 million dirhams at the start of the year, compared to 64.5 million at the end of 2016. RAK Ceramics had initially invested in its Iranian factory in 2003 with backing from the World Bank, and had taken full control of the entity in 2015, but Massaad said the facility is currently at a"standstill". "We are a UAE company and we obey and execute all of the decisions that come out," he said. "We will wait and see. Honestly, for us, it's not something important. It's not a main (market) for us." Massaad said that following substantial completion of the value creation plan, it is moving back onto a growth footing – either through acquisitions or through investment in machinery that will drive greater efficiencies. He said that the disposal of non-core assets last year meant that by the end of the first quarter of this year, only 5.4 percent of its total revenue of 661.8 million dirhams had been contributed through non-core businesses. He also argued that its spread of export markets made it "immune" to the tough market conditions that many local competitors have faced in recent years. "There is no doubt that, mid-2016, the Saudi market or the GCC market, was down. But for us, as RAK Ceramics, we grew our sales in the UAE market and Europe, plus the remaining. We never had an extraordinary great margin by focusing only one on market. RAK Ceramics is a multinational." SICO's Fernandes agreed. "The company has performed better than the rest of the pack. That's probably because they have a lot of export exposure - they are geographically diversified. And it's not that export markets were a last-minute scramble - they've been at it for a while," he said.